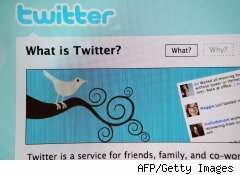 Could Twitter Upgrade Pave Way for Ad Revenue? Twitter is expanding its Web footprint by giving partners like The New York Times and Amazon.com a new and easy way to integrate some of its core short messaging and social features into their websites. Dubbed "@anywhere," Twitter says the new platform will allow users to subscribe to a reporter's latest "tweets" directly by clicking her byline and to tweet about a video without leaving YouTube. Finding interesting people to connect with on Twitter can be difficult, acknowledged Twitter CEO Evan Williams, during a Q&A session at the annual Austin, Texas, media and music conference, South by Southwest, where the platform was announced Monday. But excitement about the announcement was in short supply Monday, as many of the conferences attendees bemoaned the lackluster tenor of the Q&A and the announcement's lack of monetary impact for Twitter. Many in Williams' initial full-capacity audience simply slipped out the ballroom's back door, according to CNET News. Still, the announcement could prove to be a win for Twitter and its partners. The @anywhere platform will deliver a new level of ease for integrating Twitter services into websites, says Sean Whiteley, vice president of product marketing for San Francisco-based Salesforce.com (CRM). "When you look at a Web page, you want to be able to follow a person, look at their feed, view their profile, without having to go through all the steps you have to now," he says. "With @anywhere I think they're trying to make that experience easier for everyone." Salesforce.com already works closely with Twitter, integrating messages from Twitter.com into its customer support product, and the company is exploring ways that @anywhere can help it meet the needs of its customers, Whiteley said. In addition to making Twitter easier to integrate into new and existing websites, @anywhere will enable users to log into various sites using their Twitter user names and passwords. A limited number of sites already have this capability. The new platform could prove to be good news for Twitter, which previously has often been integrated into Web sites by way of awkward widgets that encourage users to promote content on Digg, Facebook, Delicious and countless other social media sites. Breaking out of the crowd with its own integration features could give Twitter more prominence on its partners's sites and eventually lead to a bigger and more socially interconnected audience. That could bode well for the much-discussed ad platform Twitter has been planning to launch.